1.) NFL free agency is about to start so let’s keep one thing in mind that I’ve talked about on this blog before: whoever wins free agency is not going to win in the regular season. Do the Patriots ever ‘Win’ free agency? No. Teams like the Tampa Bay Buccaneers win free agency. In fact, they were declared winners by many media outlets last year and what did that get them? The number one pick in this year’s draft. The Bills won free agency in 2012 by signing Mario Williams and haven’t sniffed the playoffs since. Keep this in mind when players start flying off the shelves on March 10. With that being said, I will definitely be up at midnight on March 10 to see who the Raiders pick up. Just because it’s fools gold doesn’t mean it’s not fun to imagine that it’s the real thing! 2.) If you can give up Michael Carter-Williams and get (potentially) the number 4 pick in the one of the next two drafts or a top ten pick in this year’s draft, I don’t have a problem with it. Put it this way, with MCW the Sixers were terrible. Without MCW, the Sixers are terrible. They aren’t winning any games this year with or without him so why not capitalize on the best value you can get for an over valued player like MCW? I like it. And if you are doubtful of Hinkie, just take a moment to watch his press conference. The dude seems like an evil genius and I have no doubt that when the time comes, he will strike and bring a superstar to the Sixers because remember, that’s what you need in the NBA. You need one of those guys like Lebron if you want to win a championship. You don’t get there by holding onto players like MCW when a chance at the potential number 4 pick (in 2016 or 2017) comes around. Some notable picks at #4: Chris Paul, Chris Bosh and Russell Westbrook. 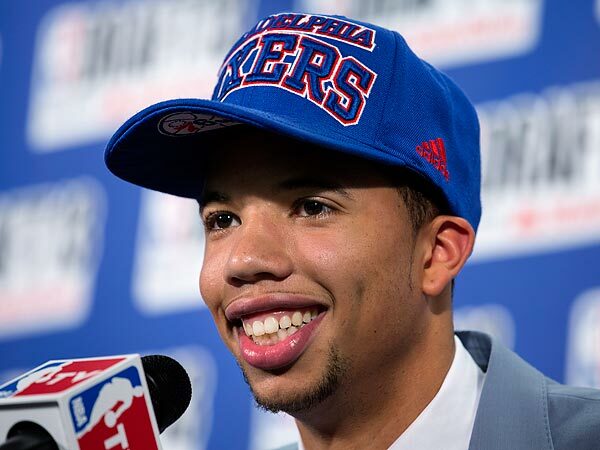 If you can acquire a pick with the potential to turn MCW into a player like that, go for it. 3.) Speaking of NBA teams, for some reason, I just don’t trust the Warriors to make it out of the West. Call it the curse of Iggy, but they just seem like they aren’t there yet. Why do I feel like it will be Memphis or San Antonio this year? 4.) The album of the week is Colleen Green’s “I Want to Grow Up.” Which is the balls. In fact, let’s just do a quick shout out to the lady rockers out there who keep churning out some of the best albums around. This year, Sleater-Kinney dominated January, now Colleen Green is rocking February, what’s next for March? Guess we’ll have to find out.